The U.S. Fish and Wildlife Service released a final recovery plan to address the survival needs of 13 rare species (two butterflies and 11 plants) native to the prairies of Oregon’s Willamette and Umpqua Valleys and southwestern Washington. Prairies in this region are among the most endangered ecosystems in the United States, with less than 1 percent remaining. The plan covers six species listed under the Endangered Species Act and recommends conservation strategies for seven other rare species, some of which are protected under state law. 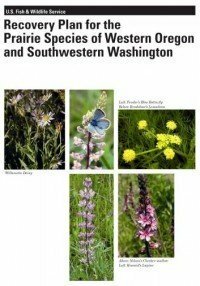 Listed species are the Fender’s blue butterfly, Willamette daisy, Bradshaw’s lomatium, Kincaid’s lupine, Nelson’s checkermallow, and golden paintbrush. Others are the Taylor’s checkerspot butterfly, pale larkspur, Willamette Valley larkspur, peacock larkspur, shaggy horkelia, white-topped aster, and Hitchcock’s blue-eyed grass.